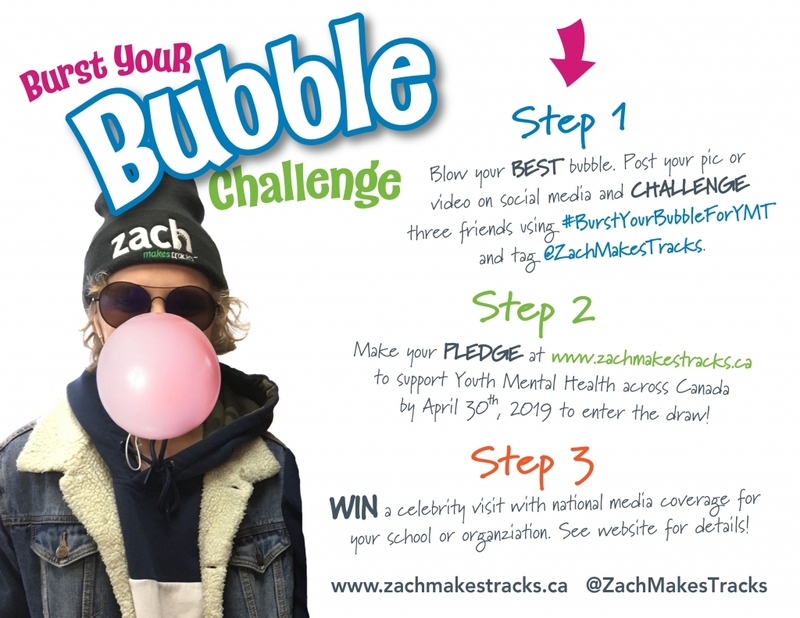 Zach’s Burst Your Bubble for Youth Mental Health Challenge! Zach is inviting you to join him in his quest to raise 2.2 million pledges, one bubble at a time! Are you a bubble blowing expert? Have a neat bubble trick? Grab that gum – we want to see what you can do. Zach Hofer is taking his mental health mission nationwide with Zach Makes Tracks 2.0! There are 2.2 million youth in Canada aged 13-19. Many will seek treatment for a mental health issue but may find wait times and lack of services. Zach’s first mission was to help youth in his community, and he was able to raise over $127,000 for his local hospital. Now, Zach wants to inspire youth across Canada to help in their own communities. And he needs your help. MISSION: To inspire 2.2 million PLEDGES. One pledge is a voice for each of our 2.2 million youth. One collective, nation-wide voice to demand action for better mental health support. HOW: There are TWO parts to Zach’s mental health mission. THE CHALLENGE. Zach’s “Burst Your Bubble” Challenge! Everyone is invited to join! Blow and burst your best bubble. Post your pic or video on social media using the hashtag #BurstYourBubbleForYMT and tagging @ZachMakesTracks and challenge three people to ‘one-up your bubble’. Register and make your PLEDGE at www.zachmakestracks.ca. THE PLEDGES. $1 =1 PLEDGE. Every dollar that is registered as a donation counts as ONE pledge. When you register online, you are prompted to enter the name of a school or organization. Every pledge is a ballot for that school/organization and is entered into a draw. Ballots will be collected until April 30th, 2019. Thirteen groups — one from each province and territory — will be selected to host a ZMT supported event on May 7th, 2019 — National Child & Youth Mental Health Day — which will include: a visit or video message from a celebrity; national media coverage; AND the honour of selecting a local mental health initiative to receive a generous portion of the funds raised. We would love to see schools and groups who don’t win the event (this year!) plan their own events to discuss mental health and raise funds – send us your pictures and let us know how it goes! Blow and burst your BEST bubble! Post your pic or video on social media and CHALLENGE three friends using #BurstYourBubbleforYMT and tag @ZachMakesTracks. Make your PLEDGE here to support Youth Mental Health across Canada by April 30th, 2019. WIN a celebrity visit with national media attention for your school or organization.